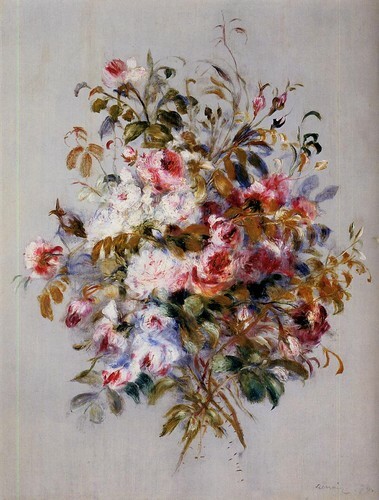 Pierre Auguste Renoir. A Bouquet of Roses, 1879. . HD Wallpaper and background images in the Fine Art club tagged: fine art painting pierre auguste renoir renoir. This Fine Art photo contains japanische aprikose, mei, ume, prunus mume, strauß, korsage, sträußchen, sträusslein, blumenstrauß, posy, nasegay, and corsage. There might also be japanische pflaume, chinesische pflaume, prunus salicina, berglorbeer, holz lorbeer, amerikanische lorbeer, kattun busch, kalmia latifolia, berg lorbeer, american lorbeer, calico busch, mountain laurel, holz laurel, amerikanischer lorbeer, calico bush, rose, röte, stieg, rosiness, and pembeliğin.